AT&T is probably offering the best total deal here, even if the actual retail price of the phone is stratospheric. 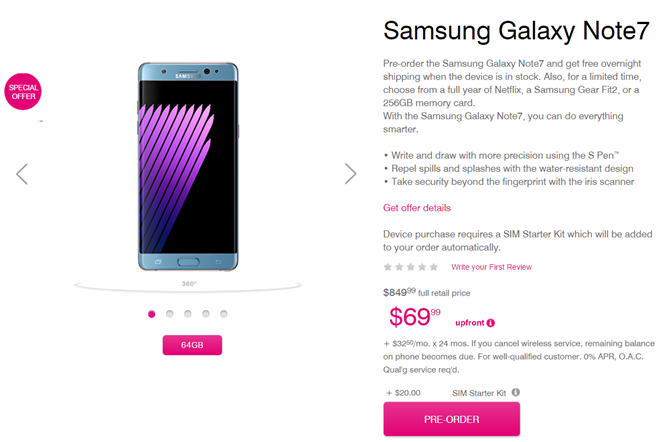 Pre-order the Note 7 and agree not to go anywhere for a couple of years, and AT&T will also throw in a Gear S2 smartwatch and a Galaxy Tab E tablet. I imagine that neither of those gadgets are in particularly high demand, but if you don't want them you can always sneak them underneath the Christmas tree in a few months. You'll still have to pay $879.99 however you slice it (and you can't get the freebies without a monthly payment plan). Phones start shipping on August 17th. Sprint will give you a Gear Fit 2 or a 256GB MicroSD card with your shiny new phone purchase, plus a $20 Visa prepaid card with either. (Note that the Gear Fit 2 is different from the Gear S2.) That's on top of the $849.99 outright price, so the effective price (ignoring the somewhat fluid value of the free hardware) is $829.99. That's still pretty enormous, but considerably easier to swallow. Sprint customers can get the freebies with a pre-order no matter whether they go with a monthly plan or a full lump payment. Sprint doesn't say when phones will ship. T-Mobile customers get the same choice between a memory card and a Gear Fit 2 smartwatch, with an additional option for a year of free Netflix. There's no Visa card over on Magenta, so the $849.99 lump sum price is a tad bit higher than Sprint, and they want seventy bucks up front even if you do go for monthly payments. Predictably, Verizon is the worst deal of the lot. They'll sell you a Galaxy Note 7 for $864, and you can have all the tablets and smartwatches and online streaming libraries you want, so long as you pay for them yourself. But if you pre-order the phone they will vaguely acknowledge that they'd like your business by waiving the $20 activation fee. Be still, my beating heart. Verizon phones will ship "by 8/19." All four carriers are accepting pre-orders now, with the silver, black, and fetching blue colors on offer. Best Buy is also offering the phone in Sprint, AT&T, and Verizon flavors, at $349.99 plus a two-year contract or a little under $30 a month (only on AT&T). But Best Buy is only offering the Gear Fit 2 option on all of them, including the Verizon version, so Big Red customers should go to the big blue shop if they want freebies and don't mind the ball and chain. As commenters have noted, the free Gear Fit 2 or MicroSD card deal is a Samsung promotion, not tied to any particular carrier. That means that Verizon fans can get in on the action as well, and that AT&T customers might be able to get all that and a bag of chips a second free watch and a tablet.